This article is about using the NextThing C.H.I.P. minicomputer with Machinekit. It explains how one can write GPIO drivers for Machinekit. Furthermore, it also shows how one can build Machinekit on the CHIP and how to cross compile an RT-PREEMPT kernel for the CHIP using the CHIP-SDK. If you are more interested in installing Machinekit and a pre-compiled RT kernel on the CHIP please take a look at "Getting started with Machinekit on the CHIP"
UPDATE September 17 2016: Applying the RT-PREEMPT kernel patch. UPDATE September 19 2016: Copying .dtb files. To control real world objects with Machinekit, we need a so-called "driver" to interface with the world. A driver is basically a computer program, or in our case a HAL component, that controls a particular device. Particularly interesting for Machinekit are GPIO drivers for different platforms. On a desktop computer, this could, for example, be a parallel port interface. For single board computers, this usually means interfacing with a GPIO peripheral in order toggle pins exposed via pin header. Inside the Machinekit source tree, these drivers can be in src/hal/drivers. Finding out how to control the GPIO pins of the target platform. 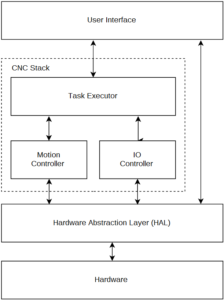 Integrating the HAL component in the Machinekit build process. Taking a look the CHIP pinout graphic we can see that there are two types of GPIO pins exposed on the pin header. The 8 normal GPIO pins labeled XIO-Pn are located in the middle of the right pin header, when looking at the CHIP with USB connector positioned upwards. These pins can be controlled using a Linux file system driver. The relevant files are contained in the /sys/class/gpio directory. There is an official Python library for controlling these pins. However, since the file system driver GPIO pins are rather slow, we are more interested in the second type of GPIO available on the CHIP. The second type of GPIO pins exposed on the CHIP are the CSIDn pins. Some users from the community found out how to control theses pins using mmap. Controlling the peripheral over shared memory also used in the GPIO driver for the BeagleBone Black. The original libsoc included with the sunxi-tools contains wrappers for controlling the pins over mmap. User yevgeniy-logachev additionally added an example how to use the libsoc functions to the repository. 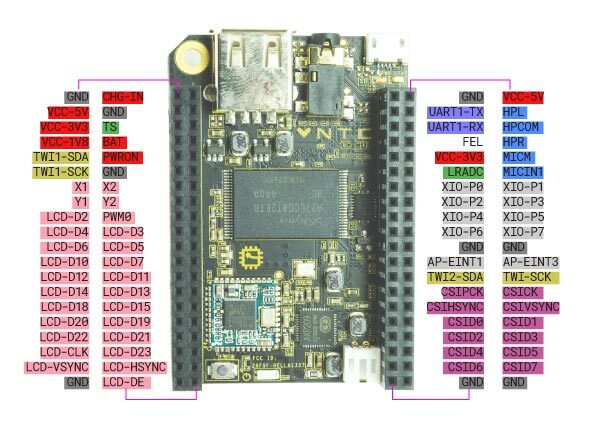 Let's take a look the functions exposed by the libsoc_mmap_gpio module. 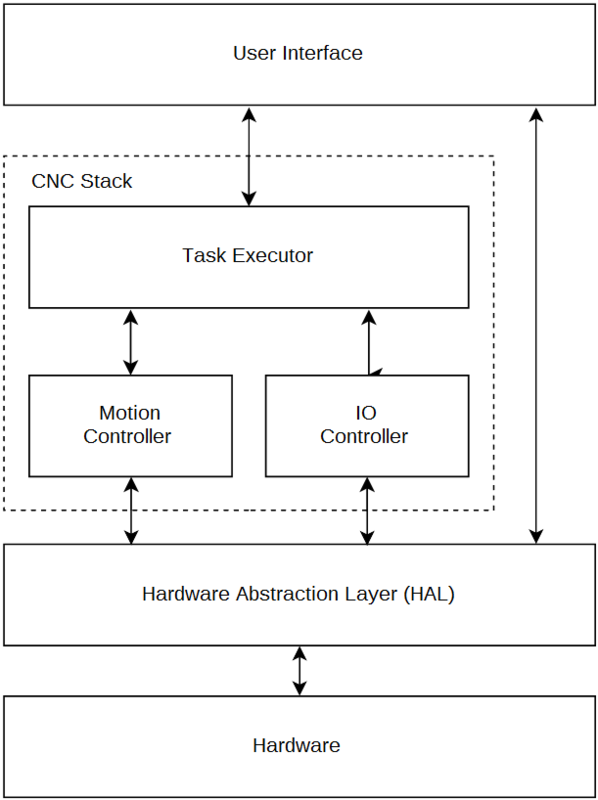 Using this information we have everything ready to implement the HAL component. For implementing the HAL GPIO driver I used the hal_bb_gpio driver as a reference. This time, we directly use the HAL C API in the component. This means that we are responsible for creating and deleting the HAL component and pins ourself. For this purpose, it is required to implement two functions in our component. int rtapi_app_main(void) is responsible for creating the HAL component. void rtapi_app_exit(void) is responsible for cleaning up everything we created. It is important that we free any memory we may have allocated in this function. Note that I will not post the complete source here, but rather explain the most important parts of the code. I recommend you taking a look at the complete source code in the Machinekit repository. In the beginning of the C file, we have to include the RTAPI and HAL header files, as well as the header file of the libsoc mmap library. I skip explaining the other included header files, which are common C headers and proceed with the platform checks and HAL module macros. #error "This driver is for usermode threads only"
#error "This driver is for the BeagleBone platform only"
First of all, we check that this component is only built for usermode threads. 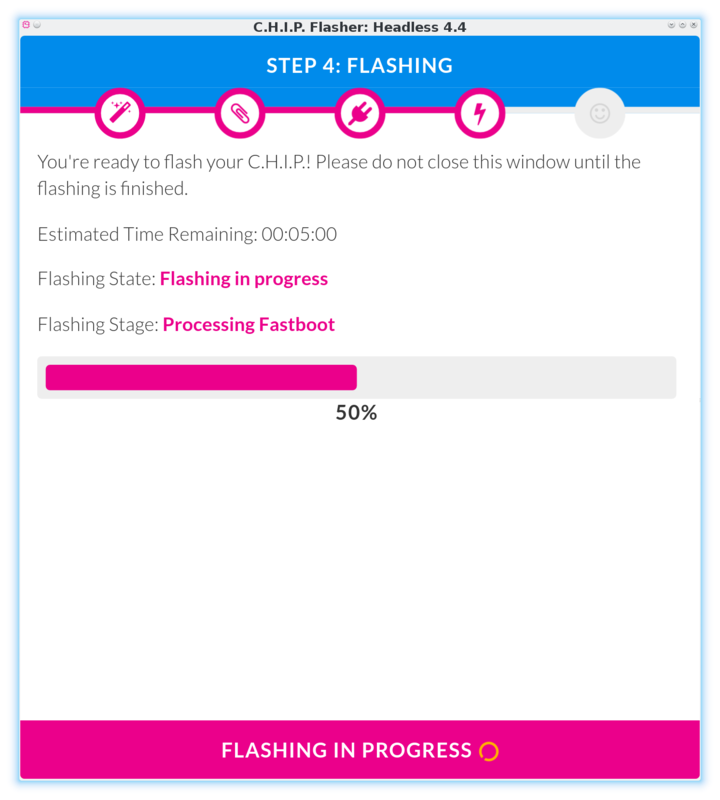 The second check verifies that the correct build platform is enabled. Then we define the module name used throughout the HAL component. The MODULE_AUTHOR and MODULE_DESCRIPTION macros are pretty self-explaining. MODULE_LICENSE needs to be GPL if the HAL component is compiled into a kernel module. As can be seen, the arrays are designed either storing the maximum amount of output or input pins, since the pins are configured at runtime. The last line of the code fragment creates an array for storing the GPIO pin handles for the libsoc mmap module. The code means that the parameters are passed as a string which can be accessed with the variables input_pins and output_pins. As stated in the comments, the pins have to be passed as comma separated list, e.g. 0,3,4. Note that num_ports is always 1 for the CHIP driver. Next, the control module is initialized by calling the configure_control_module function. Since the libsoc module handles the mmap call we only need to call the correct function. In the BeagleBone Black driver, the mmap function is called instead. Finally, it is time to create the HAL pins. Since the creation of the output pins works completely similar I only add the code fragment for adding the input pins. Walking trough the code we can see that we first split the string by using strtok. Then we create two HAL pins (one for the pin value and the other for the invert pin) by calling hal_pin_bit_newf. After that, we make sure that the input pins are initialized with a default value. The actual libsoc calls are issued to get a pin handle and to set the pin direction. The final step for initializing the HAL component is to register the HAL functions. In the case of a GPIO driver, there are usually two functions. One for reading the GPIO pins read and one for writing the GPIO pins write. It is good practice to use two separate functions for this operations so we can read the GPIO pins at the beginning of our thread cycle and update the output pins at the end of the cycle. This leaves us with the two remaining functions for writing and reading the GPIO pin states into the HAL component. Again, they are very similar so I will only explain the write_port function. Passed to the function as an argument is the port data structure port. Note that we have explicitly defined this behavior when registering the HAL functions. Using a for loop, we iterate over all pins in the structure. This makes it necessary to check for the pin beeing already created with comparing the pointer to NULL. Remember, that not necessarily all pins are output pins. Next, we take the GPIO pin handle in order to use the libsoc functions. Then we set the GPIO pin level using the libsoc_mmap_gpio_set_level function. The output pin and invert pin of the HAL component are XORed, in order to get the expected behavior. The read_port function is very similar. However, instead of setting the pin level, we read the pin level from the GPIO port and apply it to the HAL input pins. (Remember that physical input pins are HAL_OUT pins). The last step of creating the HAL GPIO driver involves adding the HAL component to the Machinekit build process. Since the driver component is platform dependent, it is good practice to only build it if the correct target platform is specified, in our case --with-platform-chip. Long story short, I basically used the TARGET_PLATFORM_ZEDBOARD as reference. If you are interested in what exactly I had to modify please take a look at the pull request. After having a HAL GPIO driver ready for the CHIP, it is time to prepare the CHIP for running Machinekit with RT PREEMPT kernel. First of all, we need to flash the CHIP with a fresh Debian Linux image. 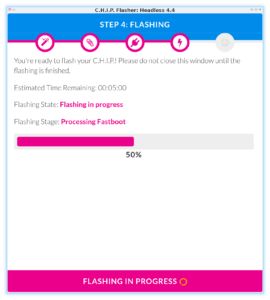 The easiest way to achieve this is to use the CHIP online flasher, which can be executed from the Chrome or Chromium browser. There is not a lot say about this step since it just worked! The next step involves building Machinekit from source on the CHIP. This is necessary since the CHIP GPIO driver has not been merged into upstream Machinekit yet. Once the patch has been merged and made its way into the ARM Debian packages, you can safely skip this step. However, it may still be useful for you as a reference if you want to port Machinekit to a new platform. EDIT: The patch is merged into upstream Machinekit. You can now install the Machinekit via apt-get install machinekit machinekit-dev machinekit-rt-preempt after adding the Machinekit repository. The steps from the Machinekit documentation work perfectly fine. During the Machinekit configure step, I hit a problem at the step of looking for the Boost::Python module. Basically, the error message was not very helpful, since it did not describe the correct problem. Taking a look in the build.log finally gave me a useful hint: virtual memory exhausted: Cannot allocate memory. Turned out that the CHIP ran out of virtual memory during the test build. Last but not least, it is time to compile a kernel with RT PREEMPT patch for the CHIP. Compiling the CHIP kernel turned out to be surprisingly easy since NextThing provides a pre-configured Vagrant configuration for cross compiling to the CHIP target. First one needs to download and install the CHIP SDK on the computer (not on the CHIP). For compiling the Linux kernel for the CHIP-SDK I used this wiki entry as a reference. Copy the kernel configuration from the CHIP to the CHIP SDK. In order to do that, I enabled the shared folder in the CHIP-SDK Vagrant configuration .Vagrantfile. On my host Linux computer I used scp to copy the config file over. Copy this file to your kernel build tree CHIP-linux. Now you need to patch the Linux kernel with the PREEMPT_RT patch. The patch can be found at kernel.org. I used the 4.4.12 patch since there is no patch exactly matching the 4.4.11 kernel. Now the Linux kernel is ready to be deployed to the CHIP. I used the approach of replacing the existing kernel on the CHIP. Note that this might lead to an unbootable CHIP if there is an error in the kernel configuration or build. For details on how to manually boot a specific kernel please refer to this wiki. The following lines need to be executed on the CHIP SDK VM. Note that I have mounted the root folder of the SDK on my host machine to ~/CHIP-SDK on the guest machine. This can be done be enabling the shared folder in the .Vagrantfile of the SDK. After a reboot, you should have a RT PREEMPT kernel running on the CHIP. To test the newly created CHIP GPIO driver one can use the following short example, which can be found in configs/ARM/CHIP/ in the Machinekit repository. This example HAL configurations initializes the hal_chip_gpio HAL component with 4 input and 4 output pins. Furthermore, the siggen component is used to output a square waveform with 10Hz on one of the pins. Using a jumper wire we can use this configuration to prove that both, input and output pins, work with our driver. 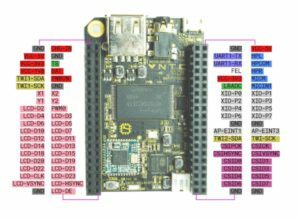 In this blog post, we discussed how to add a new GPIO driver to Machinekit, using the NextThing CHIP as an example. Furthermore, it is explained how one can compile a RT PREEMPT kernel for the platform. The result is a CHIP with working RT PREEMPT kernel and GPIO driver for Machinekit. Moreover, a short example code is presented to test the GPIO driver. The complete code can be found in the pull request on GitHub. In further blog posts, I will explore how to use the ported CHIP to control some real world objects. I hope you enjoyed reading this blog post and I appreciate your comments and feedback. CONFIG_PREEMPT_RT_FULL: Kernel Features > Preemption Model > Fully Preemptible Kernel (RT). As far as I know it's today not a part in the default 4.4.11-ntc-1 tree and need a manual patch. The `4.4.11-ntc-1` kernel tree does come with the RT-PREEMPT patch. However, I accidentally listed the wrong menu entry. It is called `Kernel Features > Preemption Model > Preemptible Kernel (Low-Latency Desktop)`. Confusing for me was, that one needs to use the Return key to open this entry. Brilliant! Thanks for covering such a great topic in detail, with CHIP becoming so popular it's very interesting seeing how you might go about porting and using Machinekit with it. 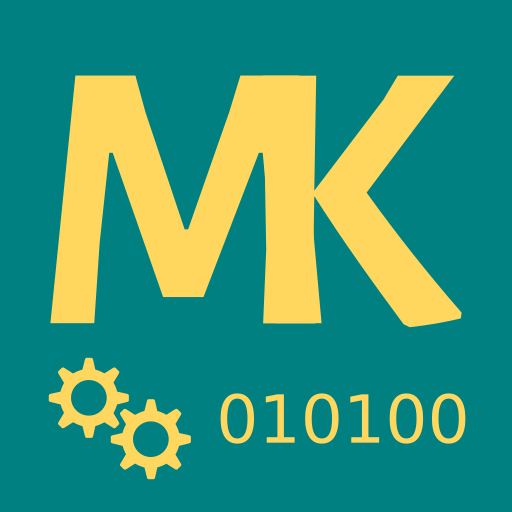 I look forward to future posts on using CHIP with MK, particularly how well it performs. I'm new to CNC on Linux so any info on how to go from an installed system to actually using MK would also be greatly appreciated. I've booted the Debian Jessie MK image on a BB Black, but am not clear what to do next to actually use it, especially since I want to use it without a cape (I'll be adding some optocouplers to GPIOs to connect to a 4-axis CNC driver that would normally be used with a PC printer port). Thanks, Larry. I still have to find out how suitable the CHIP is for controlling actual CNC machines. However, I see a lot of opportunities for Machinekit beeing used in non-traditional applications with the CHIP. If you are primarily interested in controlling CNCs, I recommend you sticking with the BBB for now. What you will need for controlling something without a cape are 3V3/5V buffers as used on the CRAMPS cape. Please stay tuned for CHIP and Machinekit getting started tutorials. I made a mistake in the blog post. I actually mean the Full RT kernel option. Without the kernel patch you can only compile the low latency (preemptive) kernel. This kernel is good for soft realtime. However, when using Machinekit we want hard realtime support. Therefore, we need to apply the RT_PREEMPT patch. I'm also seeing compilations errors in the wifi driver after applying the RT patches. Compilation worked fine before then. Did you do something to work around this problem? I noticed error messages at runtime. However, the kernel module did compile with kernel patch applied. Have you applied the debian patches for the driver? Thanks for pointing out the broken compiler flags. Thanks! The process should be similar. But for the BBB you can also use the Xenomai packages. bash: vagrant: command not found. Really worth 7 hrs of compiling.